A live monthly gathering to inspire, uplift and connect you with your Truth. Come meet your tribe! Our monthly gathering is a community of people who crave deep conversations and inspiration for lasting change and growth in their lives. Every month we discuss a different topic and Danielle will leads the group in a guided meditation. It's not as long as a workshop - only 1.5 hours - just enough time to be inspired, meditate and share space with other shining lights. Can't meet in person? Join via livestream on your computer or mobile device. Life is a wondrous adventure. Climbing the hills and scaling the valleys of our life can cause us to become tired, lose sight of where we are going and disconnect from what’s true in our heart and who we want to be. If you are searching, struggling, trying to find a deeper, more meaningful place or purpose in your life, then Wonder Woman Weekend is just what you need! 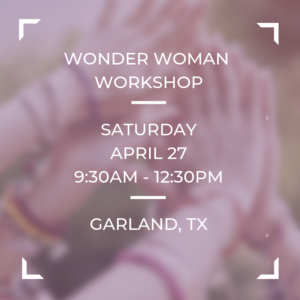 Wonder Woman Workshop is all about transformation, healing, and change. It is more than just another workshop. This is where women can open up to a new level of understanding and excavate the power and knowing the dwells within. Refuel your tank, gain more strength, and reconnect to the deeper part of you that is filled with wonder and wisdom that is unique to being a woman. Invest in yourself, reserve your seat at the workshop! a pre-session warm-up. (included) Participants are welcome to join our group/ tribe for a morning walk/run at 8am, followed by a "Breakfast Potluck" to prepare our bodies and mind for a morning of empowerment with Danielle Vaughn's life coaching segment.